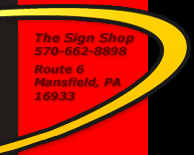 The Sign Shop is the Twin Tier’s one-stop shop for sign design, installation, maintenance and repair services. From sign repair and bulb replacement to parking lot lighting, we can do it all for you with our 40’ bucket truck and 40’ crane truck. See pictures of us servicing and maintaining signs below.